The average Bermuda car can transport 1.2 cubic yards of waste per trip. That means our containers can hold 8, 10, 15, and 25 car loads respectively (!! )– not to mention the savings on fuel, tires, and your time and back. A good size for site cleanup, small garage cleanup, bathroom demolition etc. For those little larger jobs, big garage clean-outs, small kitchen demolition, or larger amounts of heavy materials e.g. packed with fine rubble. And with a heavy duty hook lift, that means you can fill her up without worry of overweight charges. When the job is BIG…this is the one. Move 3 HC truckloads in one go! Think large kitchen demolitions, or multiple rooms of furniture for example. x1 19 Yard dumpster ($300) + $25 = $325! For those REALLY big jobs with large volumes! 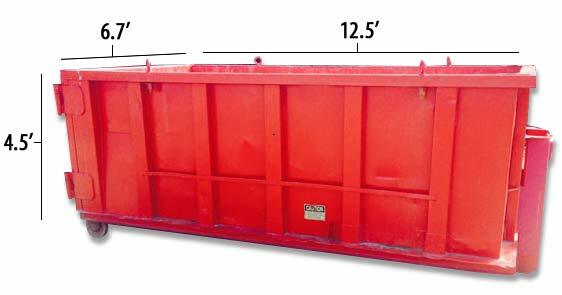 At 18′ long with 7.25′ tall reinforced sides – we believe this is the largest roll off dumpster on island. Anything bigger – is towed by a tractor trailer! 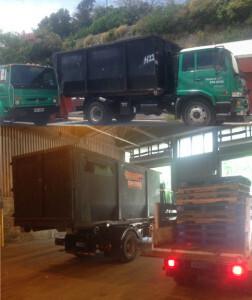 The entire HA commercial truck pictured will fit inside, with its load pf palettes, and room to spare. The double load Mack water truck is dwarfed in comparison. 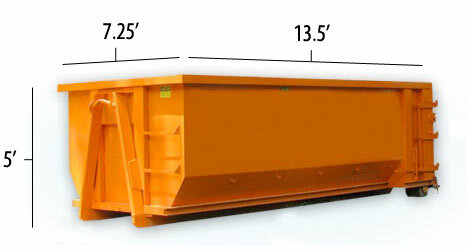 Save over 12% per yard over a 10/12 yard dumpster! Not for full loads of soil/concrete. Weight limit of contents = 5 tons! for incineration, e.g. paper products, plastic, wood, food trash. Also mattresses if separated on top. Metals, rubble, appliances (seperated), non-wood construction debris, tubs, sinks, tiles etc. House & Shutter Color, etc. I understand the Unacceptable Materials Agreement and agree to pay any charges that may result from sorting and disposing of these materials.